I’d recommend this book to goat lovers; those who want to try some new recipes based on goat meat, milk, and cheese; cookbook lovers; and anyone who just love some good food writing. It’s all there in Goat. Maaaarvelous! Catch the End of Goaterie! 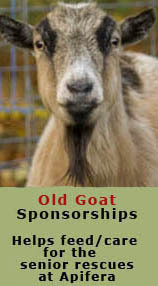 Goaterie is an event hosted by Creative Culinary and La Fuji Mama to raise awareness about the wonders of goat meat, milk, and cheese in the blogosphere and on Twitter. Check out this Testa Dura goat cheese — perfectly named for goats’ hard heads. 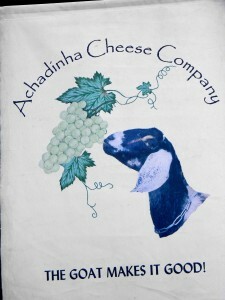 Hard to argue with that logic from the Achadinha Cheese Company. Do you like goat cheese? Stay tuned…our adventures making goat cheese will begin shortly!